Supermodel Iman watched the runways like a hawk on Fashion Week — but she wasn’t looking at the clothes. Iman joined with Naomi Campbell and veteran modeling agent Bethann Hardison for an unusual effort they are calling Balance Diversity to bring more black models to the runway, and they called out designers who whitewash their runways in the process. By all indications, their open letter made a difference, with an uptick in diversity at the previews that ended last week. All the top designers presenting in New York used at least one black model, and some who previously had no black models used as many as seven this season. What remains to be seen: Is the greater black presence on runways a lasting trend — or just more fast fashion? If black models fall out of favor next season like a short hemline, is that racist? Balance Diversity is part activist group, part blog, part watchdog. They posed a catwalk challenge just before the seasonal style previews were to begin in New York. “Eyes are on an industry that season after season watches fashion design houses consistently use … one or no models of color. No matter the intention, the result is racism,” said their open letter to the Council of Fashion Designers of America. They called out by name some industry heavyweights, including Donna Karan, Proenza Schouler, The Row, Victoria Beckham and Calvin Klein — designers the group said used almost no black models in last February’s shows. The website Jezebel calculated that 82.7 percent of that season’s New York Fashion Week models were white, 9.1 percent were Asian, 6 percent were black and 2 percent Latina. Iman and Hardison both note they aren’t calling the designers or the casting agents themselves racist — but they say defining one’s look with only white faces is a racist act. And they acknowledge that sometimes designers don’t see the models until a day or two before a show, but say they are nonetheless ultimately responsible. Some black models remain in hot demand. Campbell is the favorite, even in a jaded industry that typically likes the next big thing. The crowd at Diane von Furstenberg gave her bigger cheers than the designer. Joan Smalls and Jourdan Dunn also are consistently booked in top-tier shows. But Iman said it has to be about more than a token or two black models, and it has to be about more than the established names. 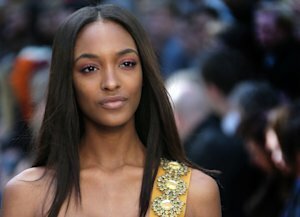 Without a turn on the runway, younger black models don’t get discovered and booked for advertising jobs. Recently, shows moved toward a blonder, whiter cast, with a few minority model slots filled by Asians, she said, in an effort to appeal to the growing consumer economies in Asia. And even when big international brands put black models on their billboards, those same brands were holding out on the runway. Designer Nanette Lepore, who was not targeted by Balance Diversity and whose runway featured a diverse group of models, said that she tries to cast a runway reflective of the world. Lepore also noted seeing more Asians, and, this season, more black models. “I think this will be the trend now,” she said optimistically. Things did change in New York: Calvin Klein, for example, increased its use of black womenswear models from zero to five this season, while The Row, the label helmed by Mary-Kate and Ashley Olsen, used seven dark-skinned models, according to Modelinia, a modeling industry website. Calvin Klein creative director Francisco Costa said in a post-show interview that this collection, inspired by the patchwork of cultures in New York City, was a celebration of diversity. He said model diversity is something he thinks about. Most designers certainly weren’t pushing toward the microphones last week to talk about this issue. Most seemed as if they’d be happy to talk only about their clothes and inspiration. Zac Posen, however, brought up the issue of diversity during a backstage interview. He said he thinks his diverse runway makes his clothes look better, and it wins him the support of models, who have backed him even when retailers and editors didn’t. Hardison and Iman did notice the improvement this season and are committed to making it last through the European shows this month and beyond to next season and next year. AP national writer Jocelyn Noveck and producer Nicole Evatt contributed to this report.